Do you want to go on the pilgrimage of Camino De Santiago in Spain? Want to know how & when to go the pilgrimage of Camino De Santiago in Spain? Here we’ve put together some useful information on Camino De Santiago in Spain. Camino De Santiago is an ancient Christian pilgrimage route that has been revived during the 20th Century. Camino De Santiago means the way of St. James in English, and the actual pilgrimage ends in the town of Santiago which is situated in North West Spain. The story of Camino De Santiago in Spain originates, according to legend, with a hermit who lived in the 9th century. He was guided in a dream and told to follow the stars, which he did, until he ended up in Santiago in Spain. It was here that he found the bones of the early Christian St. James, and it was only a matter of time before word got around and pilgrims from all over Europe started coming to see the holy relics in Spain. During this period of Christian history people believed that by performing a pilgrimage to Santiago in Spain their previous sins would be absolved and they would earn themselves a place in heaven. 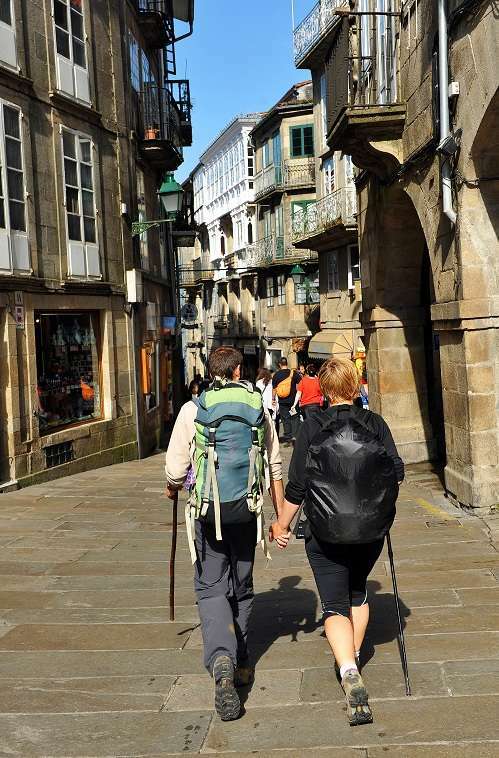 Despite obvious advances in transport in the 20th century, many pilgrims still prefer to perform their pilgrimage to Santiago in Spain either on foot or bicycle. The actual route one can take to perform the pilgrimage in Santiago in Spain varies, although the main route and most popular begins in France and passes through or near most of the major towns in the North of Spain on the way to Santiago including San Sebastian and Bilbao. Special pilgrims’ hostels along the pilgrimage route to Santiago in Spain are provided at heavily discounted rates of about 5 Euros. Demand for these pilgrims’ hostels is great and places are usually dealt on a first come first serve basis, although pilgrims travelling by foot are given preference over cyclists, who are in turn preferred over pilgrims travelling by car. Camino De Santiago is a pilgrimage that is performed all year round in Spain although one should be aware that passing through the mountainous terrain in the North of Spain during winter can be a bitterly cold experience. Most people perform their pilgrimage to Santiago in Spain beginning from April onwards, when the weather in Spain becomes more pleasant. Santiago in Spain becomes especially crowded with pilgrims from all over Spain and the world during the summer months when people have their holidays. Also, July 25th is the annual feast day in Santiago in Spain which bring in extra large crowds of pilgrims from Spain and abroad.